WASHINGTON - Venezuela's powerful vice president on Tuesday called his blacklisting by the United States on drug charges an "imperialist aggression" in the first flare-up between the two countries under new U.S. President Donald Trump. "We shall not be distracted by these miserable provocations," said Tareck El Aissami, the most senior Venezuelan official yet sanctioned by the United States. "We will see this vile aggression dispelled," he added in a series of defiant tweets before appearing on state television looking unruffled as he presided over a government meeting. The U.S. Department of Treasury on Monday labeled El Aissami a drug "kingpin," accusing him of facilitating shipments by air and sea, and having links to drug gangs in Mexico and Colombia. El Aissami joined a sanctions list that already includes a half-dozen other Venezuelan officials or former officials. The designation allows the Treasury Department to freeze assets in the United States and prevents them from conducting financial transactions through the United States. Socialist President Nicolas Maduro has frequently cast U.S. and opposition accusations of drug trafficking, corruption and human rights abuses as a false pretext to justify meddling in Venezuela and trying to topple him. Maduro, 54, narrowly won election in 2013 to replace the late Hugo Chavez, but his popularity has plummeted amid an economic crisis in the nation of 30 million people. Maduro backed his vice president, saying later on Tuesday that he had summoned the top U.S. diplomat in Venezuela, charge d'affaires Lee McClenny, to explain the "illegal" decision. "Comrade Tareck has my full support," said Maduro, flanked by El Aissami in a live television address in which he attacked the United States. Though he frequently lambasted former President Barack Obama, the Venezuelan president has in the last month refrained from criticizing Trump, though called him a "thief" and "bandit" in 2015. As well as El Aissami, the United States also blacklisted local businessman Samark Lopez, terming him a "frontman" for the vice president. Lopez responded in a statement that he was a "legitimate businessman" and "has not engaged in drug trafficking." The sanction on El Aissami, a 42-year-old lawyer and criminologist, dents Maduro's hopes that Trump might avoid a confrontation with Venezuela but could also help him by providing a nationalist card to play, said David Smilde, a Tulane University professor and Venezuela expert. "This is a tremendous gift to Maduro as it ensures El Aissami's loyalty. 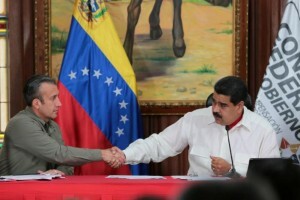 It essentially increases El Aissami's exit costs and gives him a personal stake in the continuation of 'Chavismo'," he said. "To be clear, El Aissami and others should be held responsible for their actions. However it should be understood this process has pernicious unintended consequences. I think we are effectively witnessing the creation of a rogue state." El Aissami, whom local media say is of Syrian and Lebanese descent, grew up poor in the Andean state of Merida. He was a lawmaker, interior minister and state governor for the ruling Socialist Party before becoming vice president last month. A long-time confidant and member of Chavez's and Maduro's inner circles, El Aissami was given wider powers as vice president in a decree last month and is being touted in some circles as a possible future president. Venezuelan opposition groups have long accused El Aissami of repressing dissent, participating in drug trafficking rings, and supporting Middle Eastern groups such as Hezbollah. Narcotics experts say Venezuela is a major hub for drug shipments. The Treasury Department said he oversaw or partially owned shipments of more than 1,000 kilograms (2,200 pounds) on multiple occasions, including to Mexico and the United States. The citation did not specify the drug, though the most common narcotic trafficked in the region is cocaine. "As a result of today's action, significant real property and other assets in the Miami, Florida area tied to Lopez Bello have been blocked," it said, referring to Samark Lopez. The sanction was a departure from the so-called "soft landing" approach taken by Obama's White House. At times it had clashed with efforts by the U.S. Justice Department and Drug Enforcement Administration, which worked with informants in Venezuela to nab officials for money laundering and drug crimes. Since 2015, the Obama administration had sought to use behind-the-scenes diplomacy to ease acrimony with Caracas and the fallout from a string of U.S. indictments against Venezuelan officials, including Interior Minister Nestor Reverol. "When the right wing attacks us, it shows we are advancing. Nothing and nobody will stop our victorious march to peace," Reverol tweeted on Tuesday in defense of El Aissami. The blacklisting of Venezuela's vice president follows the U.S. convictions last year of two nephews of the country's first lady, Cilia Flores, over a multimillion-dollar drug deal. Opposition leaders said it was further evidence of the rotten nature of Venezuela's state and institutions. One of them, Henry Ramos, scoffed that Venezuela would no doubt claim drugs had been planted on officials "just like they plant evidence on Venezuelan opponents to make them rot in the regime's jails." Venezuela is holding more than 100 activists in prison, according to local rights groups. The government denies the existence of political prisoners, saying all politicians in jail are there on legitimate charges.